The common Helicobacter pylori infection, also referred to as H. pylori, can develop inside your body with no apparent symptoms and seemingly without reason. We will learn more about this condition to answer the question, is H. pylori contagious? 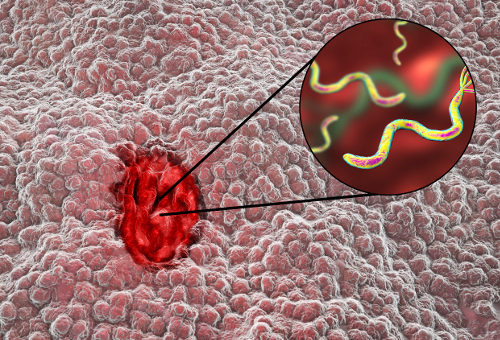 The spiral-shaped bacteria, H. pylori, can lead to health conditions such as stomach ulcer, tearing of the stomach lining, and stomach cancer. The bacteria settle into the stomach lining to evade the infection-fighting powers of the immune system. It can also modify its behavior to survive in the stomach by producing the urease enzyme. This enzyme works with urea to create acid-neutralizing ammonia to allow the harmful bacteria to remain in the stomach. Urea is a nitrogen substance found in the waste products of the body such as urine and other fluids. Let’s now get to the answer. Yes, the infection known as H. pylori is contagious. It can be passed from person to person by exchanging saliva with the sharing of utensils and cups as well as by kissing. It may also be contracted through contaminated food and water, which can stem from poor hygiene habits. This is often seen in families, between parents and offspring. Of course, the health of the immune system is an important factor as well. Not everyone exposed to the ubiquitous bacteria will contract the infection. Those with immature or weakened immune systems are naturally more susceptible to the effects of H. pylori. All of these factors may explain why the H. pylori infection is so prevalent in childhood. In fact, many cases show mild-to-no symptoms, while other cases are dormant until adulthood. Symptoms that do present may include a burning sensation in the stomach, nausea, bloating, loss of appetite, excessive belching, or sudden weight loss. These symptoms are also indicative of stomach ulcers. It should be noted that, while doctors once thought that stomach ulcers were caused by stress, spicy food, chocolate, and smoking, researchers now believe it is the bacteria H. pylori itself that causes the inner lesions. These influences are cautioned with the diagnosis of a stomach ulcer or infection as they can aggravate the condition and slow the healing process. As a highly contagious infection, the H. pylori bacteria are seen in high-risk environments such as crowded living quarters in large families or densely populated inner cities. This is especially true if you live with an infected person. If you have limited access to filtered water, even temporarily, you are at a high risk of contracting the bacteria that causes the infection. This is commonly seen in developing countries with improper hygiene practices. You may have noticed that many of the symptoms of H. pylori are similar to symptoms you can experience with other health conditions. For a proper H. pylori diagnosis, the doctor will review your medical history, as well as your family history, for medical conditions. Report any current medications, supplements, vitamins, or recreational drugs you are taking. Tests may include a physical examination of the stomach for distention or bloating, tenderness, or pain upon touch. Expect the doctor to use a stethoscope to listen to any sounds within the abdomen. In many cases, a routine complete blood count test will be ordered to detect any antibodies within the blood. The laboratory analysis will check for the presence of these proteins produced by plasma cells to destroy harmful bacteria. The H. pylori infection can be detected in the feces, so a stool sample will be requested to send to a laboratory. The breath test is done in the medical setting, as a solution containing urea is swallowed and the breath is then measured by a mechanical device. This solution is specifically created to reveal the presence of the bacteria through the response release of an enzyme. Carbon dioxide is then produced and detected by the device. If need be, you may have an endoscopic procedure where an endoscope containing a camera will be inserted into the stomach and duodenum through the mouth. The endoscope can also take tissue samples if required. It is vital to have a proper diagnosis if you suspect H. pylori, as complications can arise that may lead to life-threatening health conditions. The bacteria, or the ulcer caused by H. pylori, may cause internal bleeding, obstruction of the digestive tract, perforation of the wall of the stomach, or possibly produce an infection within the lining of the abdomen. These conditions and the H. pylori infection may be prevented by following proper basic lifestyle habits. Wash hands with soap and warm water after using the washroom. Clean hands thoroughly before and after handling food. Avoid semi-cooked or uncooked meat or poultry. Only use clean filtered water for washing and consumption. H. pylori refers to a bacterial infection within the abdominal cavity. It can lead to ulcers and other serious complications that may cause potentially fatal health conditions. H. pylori presents the same symptoms as other disorders, reinforcing the importance of a proper diagnosis. Is H. pylori contagious? Absolutely. This contagious infection is commonly seen among families, and usually appears during childhood when poor hygiene and the sharing of food and containers is common. By following the same steps to avoid any infection, including basic hand washing and food preparation rules, you may be able to prevent contraction the H. pylori infection. “What Is H. pylori?” Web MD; http://www.webmd.com/digestive-disorders/h-pylori-helicobacter-pylori#4-8, last accessed July 21, 2017. Davis, C.,“Is H. pylori Contagious?” Medicine Net; http://www.medicinenet.com/is_h_pylori_contagious/page2.htm, last accessed July 21, 2017. “H. pylori Infection,” Healthline; http://www.healthline.com/health/helicobacter-pylori#overview1, last accessed July 21, 2017. “Helicobacter pylori (H. pylori) infection,” Mayo Clinic; http://www.mayoclinic.org/diseases-conditions/h-pylori/home/ovc-20318744, last accessed July 21, 2017. “Helicobacter Pylori Infections,” Medline Plus; https://medlineplus.gov/helicobacterpyloriinfections.html, last accessed July 21, 2017.